Change your camera settings with new PES 2018 Dynamic Camera Tweak by MjTs-140914. It works with Pro Evolution Soccer 2018 PC Game. 3. 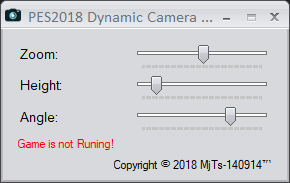 Run PES 2018 Dynamic Camera Tweak by MjTs-140914 as admin and set your preffered camera settings. 4. Play the game !